I've been busy the last few weeks creating some RTÉ twitter bots. They provide an individual twitter channel for all the RTÉ news feeds. I was actually surprised that all the names had not been taken and I even managed to get twitter.com/rte! I was inspired by the excellent BBC breaknews bot and other feed bots from menti.net. What other names/feeds need to be twitter'ized!? Anyone up for a Wee War? This is a online, round based strategy game. Each game can be played with everyone having to move within 5 minutes or 3 days. There can be up to 6 people in a game! Quite interesting concept and addictive! Head over to the website and if you need an invitation, I can send you one. Just leave a comment or send me a message! Then you can play a game with me or add me to one of yours! I've caught our National Broadcaster, RTÉ editing numerous Wikipedia articles. These include rival radio station FM104 and TodayFM's Gift Grub. I'm pretty sure FM104 does not aim themselves at a 2 year age range, and there is no denying that the Strawberry Alarm Clock has won awards. Why does RTÉ think otherwise? Surely they shouldn't edit Wikipedia if they don't have any knowledge on the article in question! Other Edits to Gift Grub mainly involve removing half the article or parts of it. They also added the following piece... very bias towards RTÉ. In December 2006, Gift Grub received a heavy blow when impressionist Oliver Callan left Today FM in a row over his alleged rights to material on the Gift Grub 7 album. His departure left the comedy slot without more than 20 of its most popular characters including Enda Kenny, RTE Newsreader Bryan 'Dobbo' Dobson, intrepid reporter Plastic Sheeting (based on RTE's Southern Correspondent Paschal Sheehy), Dave Fanning, Damien Dempsey, George W Bush, Derek Mooney, Pat Kenny, Marian Finucane and many others. Callan's claims are the subject of threatened legal action and he even went on RTE's Liveline programme to air his grievances, which generated much press coverage and dinted Gift Grub's album sales. Oliver Callan has since set up a rival comedy slot on RTE Radio called Nob Nation, which now has a much bigger audience than Gift Grub due to it being carried on both RTE Radio One and on 2FM. I've found all this using the WikiScanner. See more of RTÉ's Edits here, including a request to create a Jenny Huston article! Any response RTÉ? I know you have read my blog before! 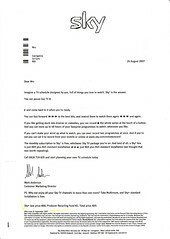 Last week my Aunt received this letter from BSkyB or Sky about Sky+. The offer she received gave her a Sky+ box for €69 with a saving of €80. Pretty good deal, I wanted in on it too! The background: She is a customer for about 2 years, has a 2 mix package and Multi-room. On the other hand we are customers for over 5 years, have a 6 mix package and had Movies and Sports for 2 years. We have never once received any offer off Sky like this. I phoned up and enquired to see if I could get this Sky+ Box, and eventually, after 3 phone calls lasting about 30 minutes each (they hung up on me once) I found out that because we did not get a letter we could not get the offer. They prefer to give their newer customers or customers on smaller packages better (or any) offers. We have to pay the full €149 to get a Sky+ Box. Since then, I have dropped our packages down to 4 mixes (after considering cancelling it all together). It's a shame SCTV Digital (that website was bloody hard to find!) has such shite service, after all it has taken 2 years to begin rolling out the promised digital!